When approaching the season, most athletes agree that there is nothing that beats the feeling of being home. After a stretch of away games, things seem to come together effortlessly competing at home with an adoring crowd, playing on a familiar field or court and being surrounded by known officials. This week, The Dartmouth examines how that home field advantage affects the performance of the Big Green’s various athletic teams. Home field advantage certainly holds true in recent history for most of the Big Green teams. With the exception of six teams, Dartmouth teams have a better winning percentage at home, many by a wide margin. When comparing the average percentage of games won at home to games won away over the past five seasons, it is evident that some teams, such as women’s rugby, men’s basketball and men’s lacrosse, play significantly better at home, winning up to six times as often. However, other teams, such as baseball, men’s squash, women’s squash and softball, succeed better on the road. Why such an advantage at home? 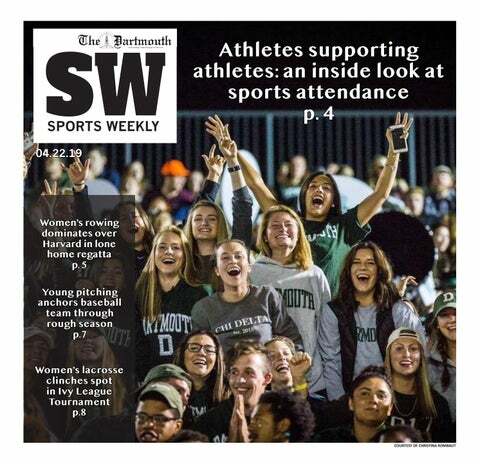 We focused on two sports — men’s basketball and women’s soccer — that easily more than tripled their away record when they had Dartmouth fans cheering behind them at home. For the men’s basketball team, their winning percentage when playing at home consistently dwarfs their performance away. With the exception of the 2016-17 season, the team won at least 40 percent of their home games over each of the past five years. This number is often double — or in the case of the 2017-18 season, seven times their away winning percentage. Although women’s soccer may not see such large discrepancies, the team was also much more likely to see victory at home in comparison to competing away over their past five seasons, a trend that was especially clear this year and in the 2013-14 season. During each of their campaigns across the 2012-13 to 2017-18 seasons, the team consistently had at least some home field advantage. A skeptic would focus on the relative strength of schedule at home versus on the road, as men’s basketball took on Notre Dame of the premier Atlantic Coastal Conference and women’s soccer traveled to battle No. 20 ranked Pepperdine University and No. 56 ranked Northeastern University this year. But both coach David McLaughlin and coach Ron Rainey, of men’s basketball and women’s soccer, respectively, believe that there is much more to it than schedule. “When you can provide a good home court environment and make it difficult for opponents to come in, it’s always going to give you an added edge going into games,” McLaughlin added. For McLaughlin, infrastructure plays a role in the fan experience which in turn affects the on-court result. Indeed, general excitement in the home atmosphere plays an integral role in pushing players to the next level. McLaughlin added that playing at home provides extra incentive to players to play even better. Though travel accommodations are improving and more players have experience on the road with club and high school teams, extended travel can still take a toll on student-athletes. To alleviate the difficulties of road play, McLaughlin discussed the importance of routines such as yoga or other walkthrough routines that provide consistency and minimize the unfamiliarity and strain travel can put on players. Both coaches highlighted games where being home helped push the team to victory late. McLaughlin spoke about Dartmouth’s first Ivy League win of the season, when they fed off the crowd’s cheers to ring off 12 points after being down 52-50 to Princeton University with 7:07 left. Despite the clear advantage afforded to the Big Green at home in five of the last six years, McLaughlin believes the team can turn into a force on the road as well. As McLaughlin alluded to, it is important to look beyond win-loss record to get the whole picture on a team’s performance on the road and away. Such is the case for the baseball team, whose poor non-league play to start the season on the road has overshadowed their early success in conference games. In February, coach Bob Whalen discussed the team’s challenging early schedule on the road in advance of their opening road series against the Georgia Institute of Technology. Home field advantage is hard to quantify for baseball as a result, as the weather in Hanover prohibited proper training for the team, and the data is skewed by a difficult non-conference schedule against strong teams in warm weather states. Though the Ivy League sample size is still minimal, there are early signs that the home-road record isn’t quite what it appears to be. The rest of the season will show if the drastic home-away split overall will even out with inclement weather and non-league play nearly in the past, but with the power of home field advantage still in force. Another interesting case is the football team, whose even winning percentages at home and away reflect a different theme. Among all the Big Green teams, the most consistent at home and away is the Dartmouth football team. Throughout the 2017-18, 2016-17, and 2014-15 seasons, their two winning percentages matched. Furthermore, in the years where the two did not align, with the exception of the 2012-13 season, a single win at home is what made the distinction. The Dartmouth discussed this trend with Emory Thompson ’18, who starred as wide receiver this year for the Big Green. Nonetheless, Thompson still feels the home field advantage McLaughlin and Rainey described and the impact of fans’ cheers when he steps onto Memorial Field. Though football bucks the trend of home field advantage, overall, there is nothing that beats playing for the Lone Pine fans in the Granite of New Hampshire.